The physical world is composed of combinations of various subatomic or fundamental particles. These are the smallest building blocks of matter. All matter except dark matter is made of molecules, which are themselves made of atoms. The atoms are the smallest constituents of ordinary matter, which can be divided without the release of electrically charged particles. The atoms consist of two parts. An atomic nucleus and an electron cloud. The electrons are spinning around the atomic nucleus. The nucleus itself is generally made of protons and neutrons but even these are composite objects. 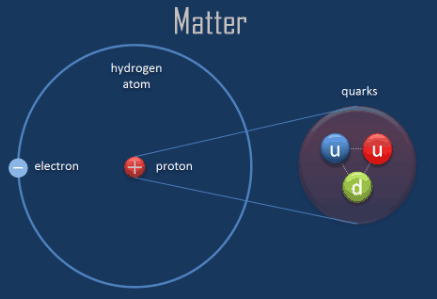 Inside the protons and neutrons, we find the quarks. The science, which deals with atoms is called atomic physics. Note that, atomic and nuclear physics are not the same. The term atomic physics is often associated with nuclear power, due to the synonymous use of atomic and nuclear in standard English. However, physicists distinguish between atomic and nuclear physics. The atomic physics deals with the atom as a system consisting of a nucleus and electrons. The nuclear physics deals with the nucleus as a system consisting of a nucleons (protons and neutrons). Main difference is in the scale. While the term atomic deals with 1Å = 10-10m, where Å is an ångström (according to Anders Jonas Ångström), the term nuclear deals with 1femtometre = 1fermi = 10-15m. Atomic physics is the field of physics that studies atoms as an isolated system of electrons and an atomic nucleus. It is primarily concerned with the arrangement of electrons around the nucleus and the processes by which these arrangements change. This includes ions as well as neutral atoms and, unless otherwise stated, for the purposes of this discussion it should be assumed that the term atom includes ions. Atomic physics also help to understand the physics of molecules, but there is also molecular physics, which describes physical properties of molecules. Every solid, liquid, gas, and plasma is composed of neutral or ionized atoms. The chemical properties of the atom are determined by the number of protons, in fact, by number and arrangement of electrons. The configuration of these electrons follows from the principles of quantum mechanics. The number of electrons in each element’s electron shells, particularly the outermost valence shell, is the primary factor in determining its chemical bonding behavior. In the periodic table, the elements are listed in order of increasing atomic number Z. 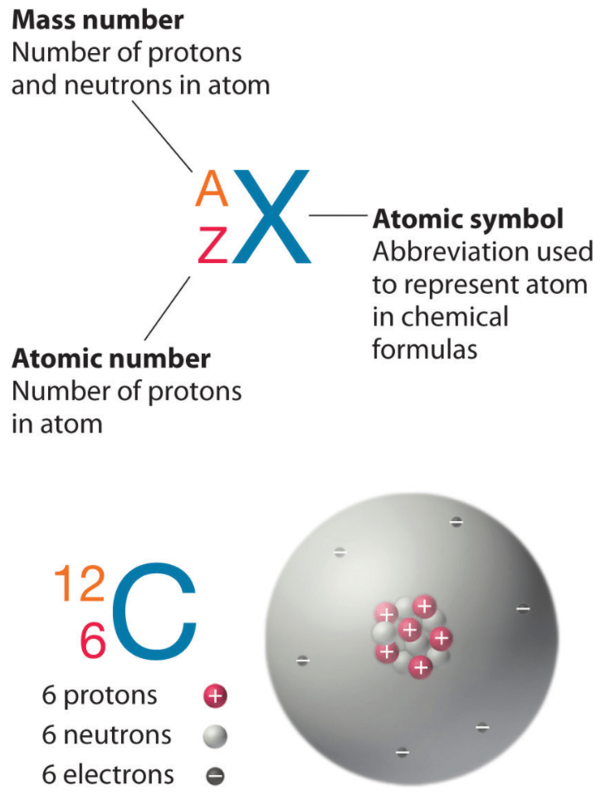 The total number of protons in the nucleus of an atom is called the atomic number (or the proton number) of the atom and is given the symbol Z. The number of electrons in an electrically-neutral atom is the same as the number of protons in the nucleus. The total electrical charge of the nucleus is therefore +Ze, where e (elementary charge) equals to 1,602 x 10-19coulombs. Each electron is influenced by the electric fields produced by the positive nuclear charge and the other (Z – 1) negative electrons in the atom. It is the Pauli exclusion principle that requires the electrons in an atom to occupy different energy levels instead of them all condensing in the ground state. The ordering of the electrons in the ground state of multielectron atoms, starts with the lowest energy state (ground state) and moves progressively from there up the energy scale until each of the atom’s electrons has been assigned a unique set of quantum numbers. This fact has key implications for the building up of the periodic table of elements. Since electrons are almost massless (in comparision to the nucleons), the total number of protons and neutrons in the nucleus of an atom determines the atomic mass. The total number of protons and neutrons in the nucleus of an atom is called the atomic mass number (or the mass number) of the atom and is given the symbol A. The mass number is different for each different isotope of a chemical element. The mass number is written either after the element name or as a superscript to the left of an element’s symbol. For example, the most common isotope of carbon is carbon-12, or 12C. The unit of measure for mass is the atomic mass unit (amu). One atomic mass unit is equal to 1.66 x 10-24 grams. 1u = 1.66 x 10-24 grams. One unified atomic mass unit is approximately the mass of one nucleon (either a single proton or neutron) and is numerically equivalent to 1 g/mol. For 12C the atomic mass is exactly 12u, since the atomic mass unit is defined from it. For other isotopes, the isotopic mass usually differs and is usually within 0.1 u of the mass number. For example, 63Cu (29 protons and 34 neutrons) has a mass number of 63 and an isotopic mass in its nuclear ground state is 62.91367 u. The neutron is slightly heavier than the proton. This increases the mass of nuclei with more neutrons than protons relative to the atomic mass unit scale based on 12C with equal numbers of protons and neutrons. The nuclear binding energy varies between nuclei. A nucleus with greater binding energy has a lower total energy, and therefore a lower mass according to Einstein’s mass-energy equivalence relation E = mc2. For 63Cu the atomic mass is less than 63 so this must be the dominant factor. Ionization energy, also called ionization potential, is the energy necessary to remove an electron from the neutral atom. where X is any atom or molecule capable of being ionized, X+ is that atom or molecule with an electron removed (positive ion), and e− is the removed electron. There is an ionization energy for each successive electron removed. The electrons that circle the nucleus move in fairly well-defined orbits. Some of these electrons are more tightly bound in the atom than others. For example, only 7.38 eV is required to remove the outermost electron from a lead atom, while 88,000 eV is required to remove the innermost electron. Ionization energy is lowest for the alkali metals which have a single electron outside a closed shell. Ionization energy increases across a row on the periodic maximum for the noble gases which have closed shells. For example, sodium requires only 496 kJ/mol or 5.14 eV/atom to ionize it. On the other hand neon, the noble gas, immediately preceding it in the periodic table, requires 2081 kJ/mol or 21.56 eV/atom. The ionization energy associated with removal of the first electron is most commonly used. The nth ionization energy refers to the amount of energy required to remove an electron from the species with a charge of (n-1). For example, only 7.38 eV is required to remove the outermost electron from a lead atom, while 88,000 eV is required to remove the innermost electron. The volume of an atom is about 15 orders of magnitude larger than the volume of a nucleus. For uranium atom, the Van der Waals radius is about 186 pm = 1.86 ×10−10m. The Van der Waals radius, rw, of an atom is the radius of an imaginary hard sphere representing the distance of closest approach for another atom. Assuming spherical shape, the uranium atom have volume of about 26.9 ×10−30 m3. But this “huge” space is occupied primarily by electrons, because the nucleusoccupies only about 1721×10−45 m3 of space. 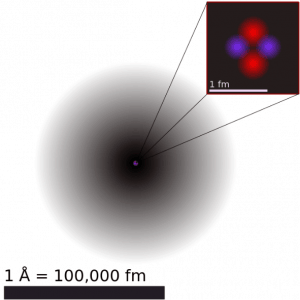 These electrons together weigh only a fraction (let say 0.05%) of entire atom. It may seem, that the space and in fact the matter is empty, but it is not. Due to the quantum nature of electrons, the electrons are not point particles, they are smeared out over the whole atom. The classical description cannot be used to describe things on the atomic scale. On the atomic scale, physicists have found that quantum mechanics describes things very well on that scale. Particle locations in quantum mechanics are not at an exact position, they are described by a probability density function. Therefore the space in an atom (between electrons and an atomic nucleus) is not empty, but it is filled by a probability density function of electrons (usually known as “electron cloud“). 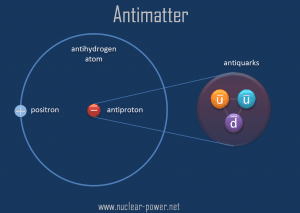 Antimatter is a term referring to material that would be made up of “antiatoms” in which antiprotons and antineutrons would form the nucleus around which positrons (antielectrons) would move. The term is also used for antiparticles in general. Antimatter particles bind with one another to form antimatter, just as ordinary particles bind to form normal matter. 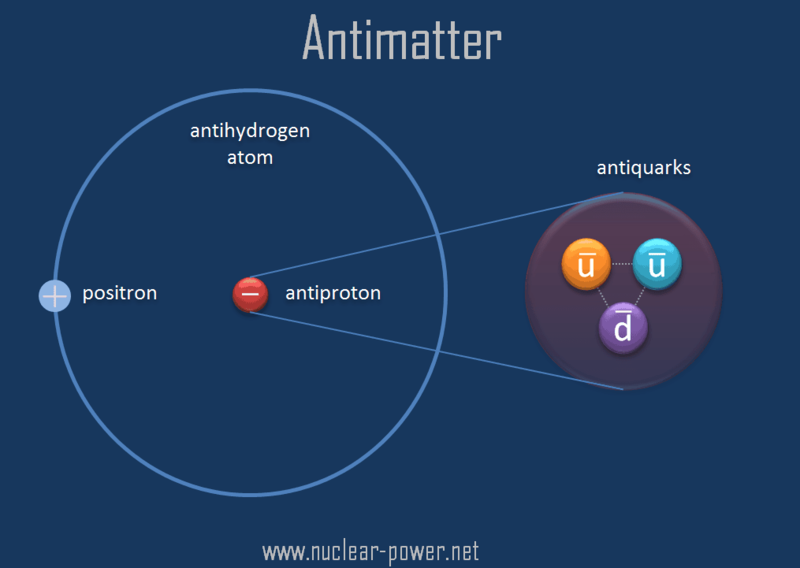 For example, a positron and an antiproton can form an antihydrogen atom. Physical principles indicate that complex antimatter atomic nuclei are possible, as well as anti-atoms corresponding to the known chemical elements. Our visible Universe is almost entirely composed of matter, and very little antimatter has existed since the Big Bang. This problem is known as the baryon asymmetry. This asymmetry of matter and antimatter in the visible universe is one of the great unsolved problems in physics. In special theory of relativity certain types of matter may be created or destroyed, but in all of these processes, the mass and energy associated with such matter remains unchanged in quantity. As a result of the conservation of lepton and baryon numbers, antimatter (antiparticles) can be created out of energy, but only if a particle counterpart for every antiparticle is created as well.